The fractionated CO2 laser offers a means to improve skin quality and can be performed in the office or as an adjunct to surgery. The skin resurfacing can be offered as a single ablative treatment or a series of treatments, depending on the desired goals and time for recovery. Laser treatment along with a personally curated skin care regimen will effectively minimize signs of aging skin. 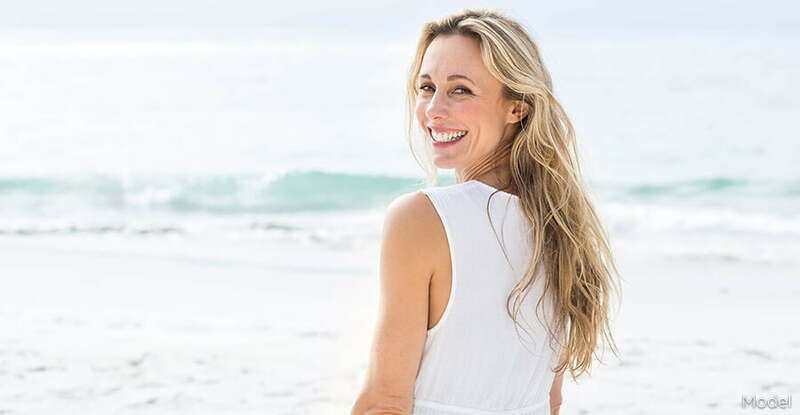 On the day of your consultation, your Restore SD Plastic surgeon will review your facial anatomy, your concerns and establish a plan for treatment. A period of skin care prior to laser treatment will enhance the results. In order to provide the safest outcome, you will also be prescribed antiviral medication to take prior to the laser procedure. On the day of your in-office procedure, we apply a gentle cleanser and a topical local anesthetic. Cool air and ice packs can be applied before and after treatment to make laser treatments as comfortable as possible. If preferred, we can prescribe a mild sedative ahead of time to make your procedure more comfortable but this will require a responsible adult to drive you home. Your provider will then treat the areas of the face, neck, decolletage and hands in a safe and calm environment. Immediately afterward we apply a medical grade serum and a barrier cream. There is some minor heat at the time of treatment but the warm feeling of sunburn gradually resolves over the next few hours. You can experience some swelling and a sunburned appearance for approximately a week. As your dead skin cells are shed, you can have some skin flaking which is minimized by a good moisturizer. Your skin needs to stay protected with sunscreen during the healing process. You will be guided by the Restore SD team through the post treatment regimen to ensure that you heal quickly and safely. Laser treatments are performed in the office setting and are generally repeated at regular intervals of 4-6 months. We can help you avoid hectic scheduling by setting up your next visit as you leave! Expect some warmth and redness at the time of treatment that tends to resolve within the first day. Your face can appear sunburned or peeling up to 2 weeks after treatment. It is important to minimize sun exposure during the recovery process – laser treatment is best performed after and not before a sun-drenched vacation. Laser treatments complement other facial rejuvenation procedures to restore youth and vitality to your appearance. It is often combined with fillers such as Voluma®, Juvederm®, or Restylane® as well as neuromodulators like BOTOX® Cosmetic. Embrace your new BFF – BOTOX® Cosmetic, Fillers, and Fractionated Laser! Your Restore SD team will make individualized recommendations for your skin type to ensure you have the healthiest and youngest appearing skin and facial profile possible. Our medical grade skin care products are not available in retail stores and a complimentary skin care evaluation is offered at every Restore SD consultation. What happens at my Laser Therapy consultation? During your initial consultation, your Restore SD provider will perform a detailed facial and skin examination as well as review your medical history and any medications you are taking. You will have photos taken with our Vectra 3D imaging system and discuss treatment areas and options while viewing your photo series. This ensures you can address all areas of concern with your provider. With our state of the art Canfield software, potential results can be viewed, helping you to visualize possible outcomes. The pricing of laser treatment reflects the investment in technology and maintenance of our laser treatment options as well as Restore SD Plastic Surgery’s commitment to safety, training and proper credentials for every provider. Our personal pricing for laser therapy reflects our years of experience and precise knowledge of the anatomy necessary to provide you with a safe, reliable, and consistent experience. Your comfort is of paramount importance at Restore SD Plastic Surgery. Rest assured that most patients report the discomfort from laser treatments as being very minimal. We apply a numbing cream before the treatment begins, cooling air during the treatment, and cooling ice packs after to minimize any discomfort. For your comfort we can also prescribe a mild sedative but this requires you to have a responsible adult available to drive you home. Why should I choose Restore SD for Laser Treatment? At Restore SD Plastic Surgery, we take the time to listen to your goals and partner with you to achieve the best possible results. We stand by our choice of technology and our experience. Allow us to deliver a safe, quality, and age appropriate facial rejuvenation that will leave you looking and feeling younger and more self-confident. I am considering Laser Therapy for the first time – what do I need to know? Laser therapy is a wonderful way to look and feel younger and is maximized when combined with an individualized skin care program. The importance of sun protection after treatment is critical and a commitment to sunscreen will ensure your results are maintained for as long as possible. How long do the effects of Laser Therapy last? Depending on the type of laser you choose, and the depth of treatment, the results can be gained in a series of treatments or a single treatment that requires a longer (2 weeks) downtime. Once you reach your treatment goal, the results can last for years. The results are longer lasting and enhanced when you embrace a skin care regimen that provides your skin nourishment and sun protection.